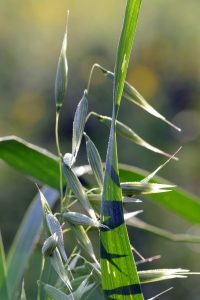 The same oats eaten for oatmeal are also used as a medicinal too. Every heard someone say grass is only for bunnies? Nope. Humans eat grasses too. Oats are one of them. The best part of an oat plant to use is the seed at milky stage and second best are the leaves and stems called oatstraw. When the seeds are pinched a milky looking substances pops out. After milky stage is when the plant is harvested to make rolled oats. Eating oatmeal is soothing to the stomach. Adding oats to skin care products soothes the skin. Milky oat straw infusion and tincture are soothing to the nerves. Especially for nervous exhaustion associated with depression and symptoms from drug withdrawal. It doesn’t work instantly. It’s an herbal preparation that must be taken regularly to feel benefits. I like it as a nourishing infusion: 1 ounce of dried herb, 1 quart of boiling water poured over it, let steep for 4 hours, add honey to taste. Growing tips: I’ve grown it in containers and raised garden beds. You need to grow a lot to keep a supply for nourshing infusions. Oats are fairly easy to grow in well drained soil that is kept wet just enough to allow the seed to sprout but not enough to rot the seed away. Harvest the tops when they begin the milky stage or before it ripens into a hard seed. Air dries very well.